What are the qualities of great leaders? – Lead. Learn. Grow. We could read tons of biographies on great leaders, and I am not discouraging you from doing so. However, many of you have worked for great leaders, have met great leaders, or are great leaders yourselves. What are the qualities that distinguish good leaders from great and how do we begin to cultivate those qualities in others? 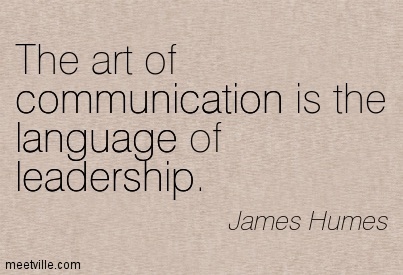 In my humble opinion, great leaders work to be better communicators. Whether that means that you are transparent, detailed, or articulate, you are a leader who understands that delivery of the message is just as important as the message itself. You are cognizant of the many ways leaders communicate their message and pay close attention to your nonverbal as well as your verbal communication. Please feel free to share your ideas by commenting on this post. We said as a leader without communications you travel alone.